Hey, listen up! Christmas is almost upon us! If you haven’t done so it’s time to go out, grab yourself a tree, and starting hanging baubles on its branches. As someone who plays the Legend of Zelda games, you’ll know how great trees are: they talk in ye olde English, they send fairies to summon young boys to save the world, and if you help them out they sometimes give you giant emeralds! Perhaps your tree just doesn’t have the right sort of fairy to summon you to greatness! Take the jump to find out how to remedy the situation. Behold, YouTube user iHasCupquake has produced a video showing you how to make your very own Navi tree ornament. How brilliant is that! 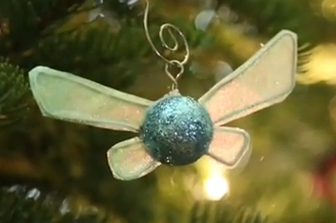 So if you’ve got a spare branch on your tree, why not go make yourself one of these? And if you haven’t got a spare branch, why not go throw one of those old ornaments away and make one of these? Will you be making one for your tree? Or have you got a better Zelda themed ornament to share? Let us know in the comments!